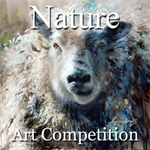 Light Space & Time Online Art Gallery announces a call for art for the gallery’s 4th Annual “Nature” Juried Online Art Competition for the month of October 2014. The gallery invites all 2D and 3D artists (including photography) from around the world to make online submissions for possible inclusion in the Gallery’s November 2014 online group art exhibition. For this theme, "Nature" will be the artist’s depiction of the physical world and is considered to be anything that was not created or substantially altered by man. Subjects to encompass the “Nature” theme would include geographical sites, natural objects, wildlife and natural environments. The deadline to apply to this art competition is October 27, 2014.